Betty-Ann Bryce, Department of Agriculture (far right), speaks about the impact of drug addiction on rural American communities during a panel discussion at the March 14 meeting of the Coordinating Council on Juvenile Justice and Delinquency Prevention on the impact of the opioid crisis on youth. Listening are fellow panelists (left to right): Ramon Bonzon, Public Health Advisor, Substance Abuse and Mental Health Services Administration; Tara Kunkel, senior drug policy analyst, Bureau of Justice Assistance; and Kellie Blue, associate administrator, Office of Juvenile Justice and Delinquency Prevention. WASHINGTON, D.C. – The anecdotal evidence is staggering: Children as young as 12 raising their siblings because their parents are lost in addiction; kids who learn to count by separating pills for drug-addicted parents; juveniles adjusting to life with sober foster parents after spending years learning to cope with parents who were always high. These were just a few examples provided by the Department of Agriculture's Betty-Ann Bryce on how the national opioid and addiction crisis has impacted youth across America's most rural areas. 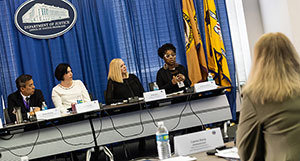 Bryce spoke as part of a federal interagency panel during the March 14 Coordinating Council on Juvenile Justice and Delinquency Prevention meeting hosted by the Office of Juvenile Justice and Delinquency Prevention at the Office of Justice Programs. Opioid-related overdose deaths of people aged 15-24 increased six-fold from 1999 (620 deaths) to 2017 (4,024), according to data presented from the U.S. Centers for Disease Control and Prevention. More than 3.3 million people aged 12 to 25 abused opioids in 2017, compared to 8.1 million people aged 26 and older, according to data presented by the Substance Abuse and Mental Health Services Administration. "Today, we don't just have an opioid epidemic—we have a substance abuse epidemic," said panelist June Sivilli, associate director of the Public Health, Education, and Treatment division of the Office of National Drug Control Policy. Panel members from five federal agencies spoke about the work they contribute to overall federal efforts to combat opioids' impact on youth. They do this through research, data-driven response and awareness programs, as well as grant and program funding to state, local and tribal communities. For example, OJP awarded more than $320 million in grant awards in Fiscal Year 2018 to address the crisis, including $46.6 million to help impacted children and fund mentor programs for children with addicted parents. An additional $35.5 million was awarded to help establish new programs to provide services to child victims of the crisis. Still, more work is needed, both to understand the dynamics of the communities at most risk, as well as to make sure families are getting all the help that's available to them. "What we're seeing is that rural communities are not taking advantage of everything we've just talked about, and that's because they're not well prepared," said Bryce. "Most rural communities are in some form of economic distress, have less access to resources; and there are transportation gaps and less [internet] connectivity." Part of the solution is getting help to recognize opioid and heroin use in youth. Sivilli called on pediatricians, dentists, family court judges and others who come into contact with drug-using youth to guide them toward treatment immediately—a tactic especially critical to save those who are using, or even just experimenting with, these drugs, according to Sivilli. "Even a one-time use can lead to an overdose," she said. To help jurisdictions better understand the scope of the opioid problem, OJP's Bureau of Justice Assistance has invested about $3 million into a tool called "OD Map," a tracking system that provides data about fatal and non-fatal overdoses, according to panel member Tara Kunkel, a senior drug policy adviser for BJA. Data from that system can be used to fuel intervention programs and make sure the right resources reach the most heavily impacted communities. The data are also used to alert first responders, courts, schools – and drug users – during times of crisis, such as when a potentially fatal batch of drugs has infiltrated a community. OD map helps identify overdose response trends geographically, which communities can then use to alert first responders, school staff, and other medical and public health partners of areas of particular substance abuse susceptibility, according to Kunkel. Other OJP-funded initiatives to help combat the impact of opioids on America's youth include OJJDP's Opioid Affected Youth Initiative. This program grants funds to states, local governments and tribal jurisdictions to develop data-driven responses to the challenges resulting from opioid abuse that impact youth, families and community safety. Under this initiative, OJJDP awarded $7 million in Fiscal Year 2018 to fund six sites, and another seven sites will be funded in 2019. "The goal is to develop a truly multi-disciplinary task force at each site to collect data that identify specific areas of concern within that community," said panelist Kellie Blue, associate administrator for OJJDP's Intervention Division. A complete listing of opioid-related federal funding opportunities can be found online at https://ojp.gov/ojpblog/blogs-2019/Federal-Resources-Opioids.pdf. 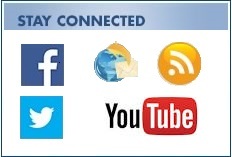 A listing of online, opioid-related federal resources is available at https://www.coapresources.org/ItemsOfInterest/FederalInitiatives. A video recording of the March 14 Coordinating Council on Juvenile Justice and Delinquency Prevention meeting will be made available online at: https://www.juvenilecouncil.gov/meetings.html.